While summer hasn’t officially started here in Houston, it definitely feels like it has! We are already getting some super hot temperatures and the official start to the season is just around the corner. The hot weather has some of my larger DIY projects on pause (it’s way to hot in the garage!) so I’m inside doing a bit of crafting! 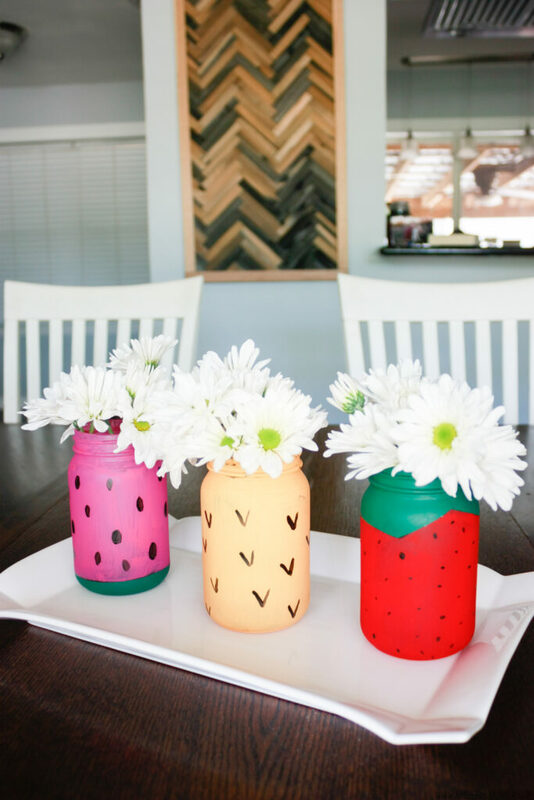 Mason jar crafts are super popular and it’s easy to see why! They are versatile and easily customizeable. They are great for decorating and for gift giving. The possibilities are almost endless! 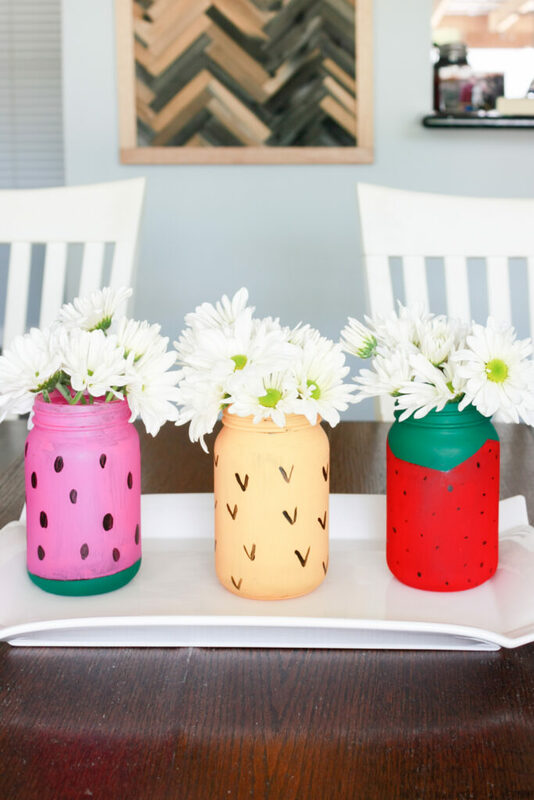 I created these fruit themed jars that are perfect for this time of year; watermelon, strawberry, and pineapple have “sweet summertime” written all over them! 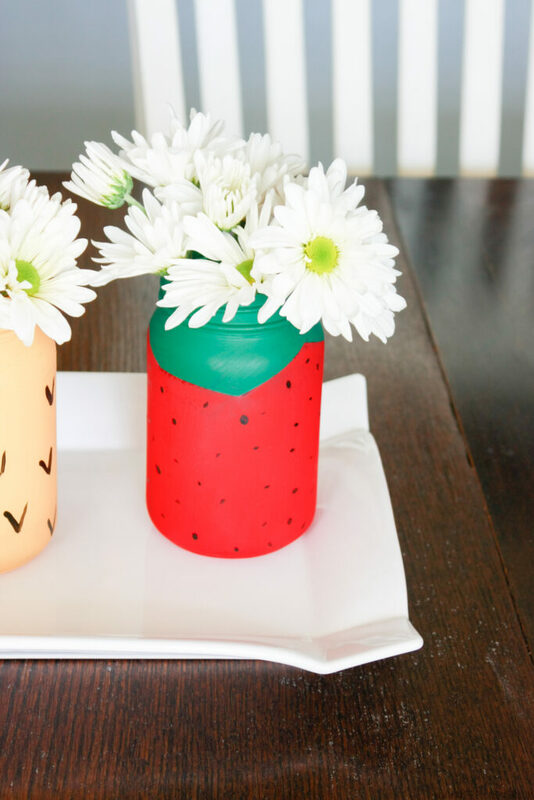 These are also a great crafting project to do with kids who are home for the summer. When it’s too hot to go outside, the best way to spend your time is inside crafting! Add black v’s all over. 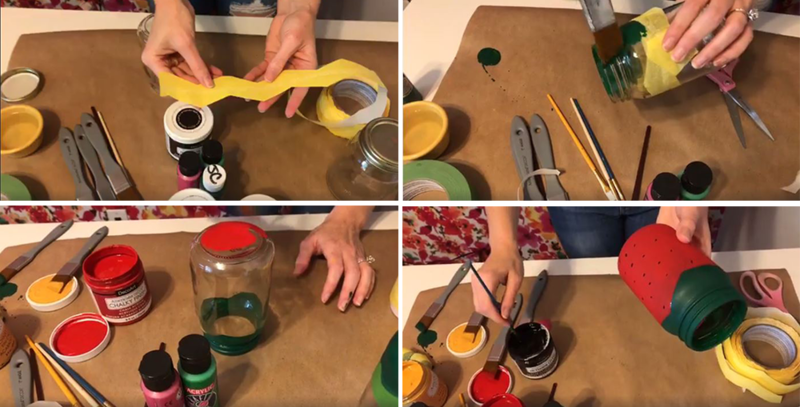 Place painters tape around the bottom of the jar. Once the paint dries, paint the top section pink. Add tear drop shapes in black paint for the “seeds”. 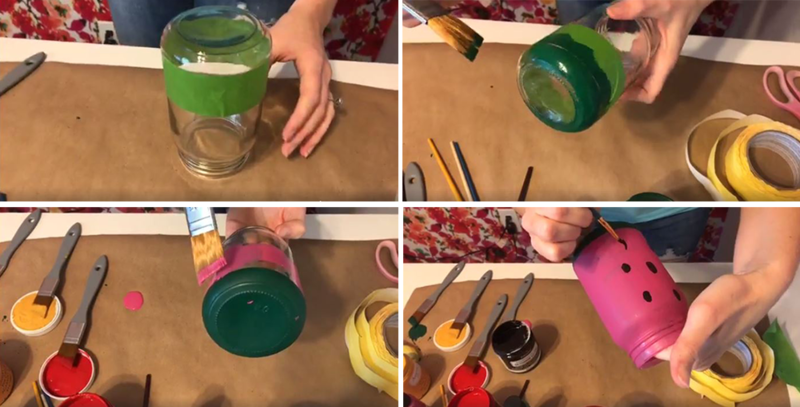 Use the chevron painters tape around the top of the jar. Paint the top section green. After the green paint dries, paint the bottom section red. Add tiny black polka dots. 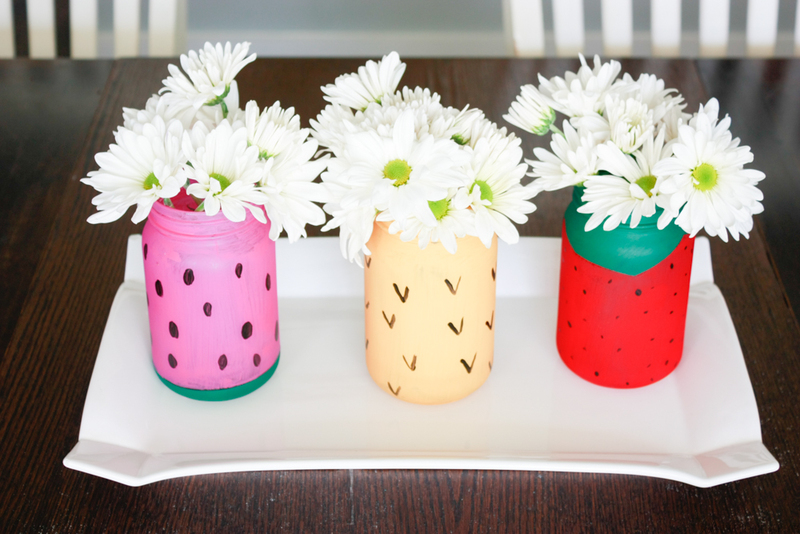 I added fresh flowers to my mason jars to make a colorful centerpiece, but you could use these jars any way you want! How about using them to hold plastic forks and knives at your next backyard BBQ? Or in your bathroom to hold cotton balls and q-tips. Check out the LIVE DIY! 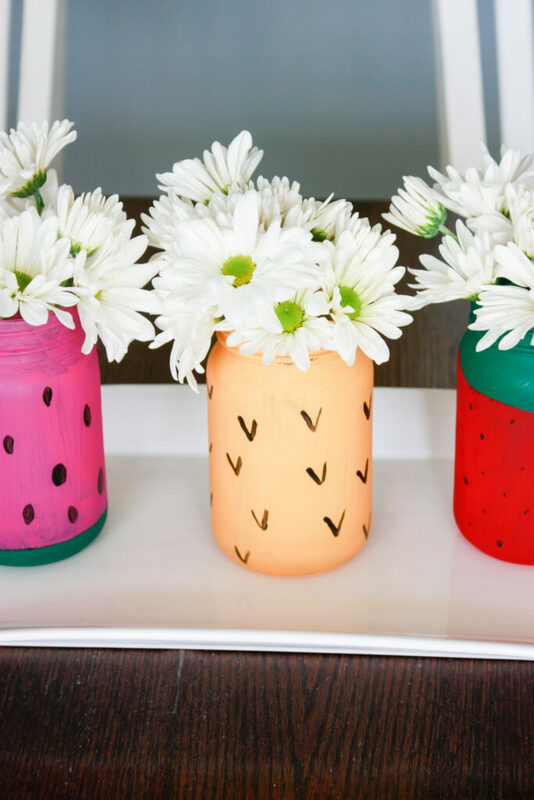 Be sure to click through my DIY project gallery to find other colorful projects! « Kitchen Organization Labels – Free vinyl kitchen labels!